This Ryumon masterpiece will be a treasured piece of your Samurai sword collection for years to come, featuring a meticulously hand-forged AIS 1060 high carbon steel blade done in the traditional katana design. It is hand sharpened and features a heavy blood groove spanning the blade for additional authenticity. The 7mm-thick blade is hefty and has a commanding presence. Superb attention to detail is seen throughout the design of this exceptional blade, and it continues with the cord-wrapped genuine ray skin handle. 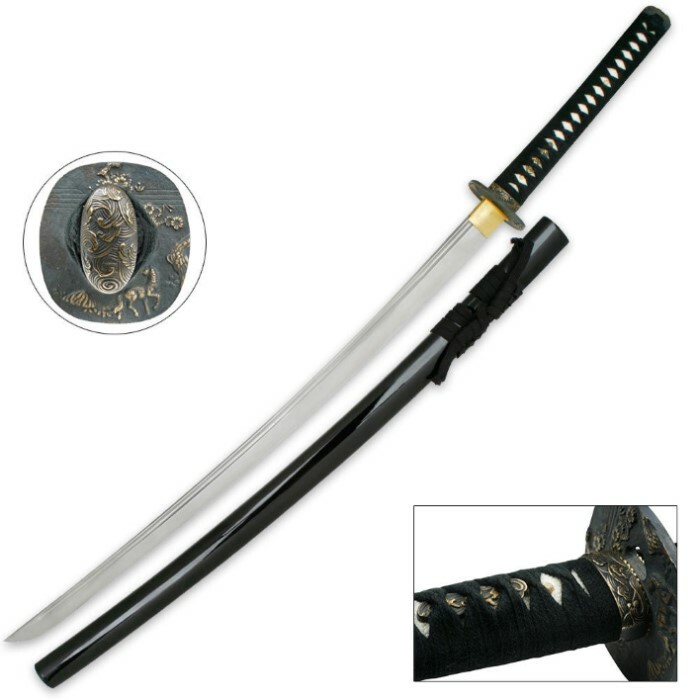 A handsome decorative tsuba and pommel, along with attractive brass accents, complete this katana sword in exquisite fashion. The high-gloss lacquered scabbard houses the 28" blade, and this treasure includes a certificate of authenticity, hang tag, storage bag and cleaning kit.